City and township residents will vote on Tuesday, April 20, to decide if the city of Paynesville and Paynes-ville Township should join forces to build an aquatic park in town. The Paynesville Township Board of Supervisors approved holding an election for township voters in April last week. The Paynesville City Council had approved holding an election on Tuesday, April 20, last month. The vote will decide if the pool project - which has been studied for the past 18 months or so by an ad hoc pool committee - will come to fruition. The proposal is an outdoor aquatic park, to be located on school property (between the student parking lot at the high school and the armory) and to cost in the neighborhood of $1.25 million. 2,776 sq. 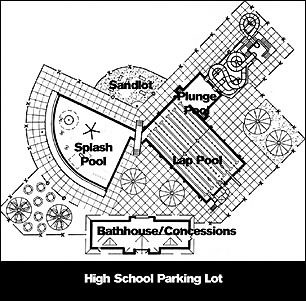 ft. splash area with zero-depth entry, maximum depth of 3' 6"
Two informational meetings will be held next week to explain the project to the public. The meetings will be held in the school auditorium and will feature a power point presentation by the consulting engineers - USAquatics - and a question-and-answer session. The first information meeting will be held on Thursday, Feb. 26, at 7:30 p.m., and the second on Sunday, Feb. 29, at 2 p.m. The presentation at both meetings will be the same, though the question-and-answer session will be different depending on the audience questions. In addition to the informational meetings next week, the ad hoc pool committee plans to have a booth next month at the Farm and Home Expo, said city administrator Steve Helget, and members plan to visit various civic groups and organizations to explain the proposal and answer questions. "We want people to understand exactly what is being proposed, so they can make an educated vote," said Helget. The aquatic park, according to the feasibility study released last summer, would include a six-lane competitive pool; a diving well for a diving board and drop slide; a plunge pool for two water slides (though one slide would be bid as an alternate); and a 2,776 sq. ft. splash area with zero-depth entry (meaning kids could wade into this pool, which would gradually get deeper). The facility would also include a bathhouse with lockerrooms, office, and concessions stand. 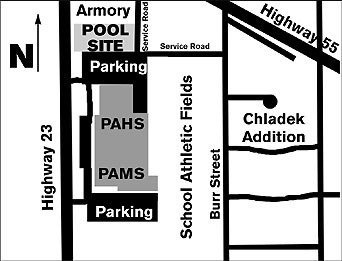 The proposed aquatic park would be located on school district property between the student parking at Paynesville Area High School and the armory (an area currently used as practice fields). To use school property, the city has agreed to cover 25 percent of the maintenance costs of the student parking lot and the two service roads. Plus, the city will replace the athletic field elsewhere on school property. According to the feasibility study, the cost of such a facility is estimated at $1.23 million, with another $150,000 in features (including a second water slide) to be bid as alternates, and the city to provide $156,000 in donated work and equipment. The township contribution would be capped at $475,000, which is 38 percent of a $1.25 million project. If either vote fails in April, the agreement is null and void. If both votes pass, the city would appoint a council member and the township would appoint a supervisor to the aquatic park board, also comprised by the ad hoc pool committee. This board would develop the specific plans for the aquatic park, let bids for construction, and oversee its construction. For the city to bond for $775,000 (their share of a $1.25 million project) over 15 years would mean an average property tax increase of $68.46 for a $100,000 residential homestead, an average property tax increase of $85.58 for a $125,000 residential homestead, an average property tax increase of $102.69 for a $150,000 residential homestead, an average property tax increase of $68.46 for a $100,000 commercial or industrial business, and an average property tax increase of $342.31 for a $300,000 commercial or industrial business. The township has not decided how long to levy to pay their portion of the pool, but bonding costs and interest could increase their share by another $100,000. Repaying that over 15 years would mean an average property tax increase of $22.64 for a $100,000 residential homestead, an average property tax increase of $68.46 for a $100,000 residential homestead, and an average property tax increase of $67.92 for a $300,000 residential property. If the aquatic park is approved in April, engineering specifications would need to be prepared and the project could be bid this summer. Construction could then start in the fall (ideal for a pool) and continue through the winter, said Helget. Then the aquatic park could open by Memorial Day 2005. Once built, the city would assume ownership of the aquatic park and would be responsible for all maintenance, operation, and improvements at the facility. Essentially, the joint powers agreement would end when the pool was finished, with the only surviving clause being that city and township residents would always be treated equally when using the pool. During the negotiations over the pool agreement, the township had offered to be a joint owner of the pool if the city would assume 50 percent ownership in the Koronis Civic Arena - owned solely by the township - and accept responsibility for half of the maintenance and improvements at that facility. But the city and township could not reach an agreement about this, so it was decided that the city would take responsibility for the pool and the township would keep responsibility for the ice arena. City residents will vote on the aquatic park proposal at the Paynesville Area Center on Tuesday, April 20, from 7 a.m. to 8 p.m. Normal township voting hours are from 12 noon to 8 p.m. at the township hall on Koronis Drive.